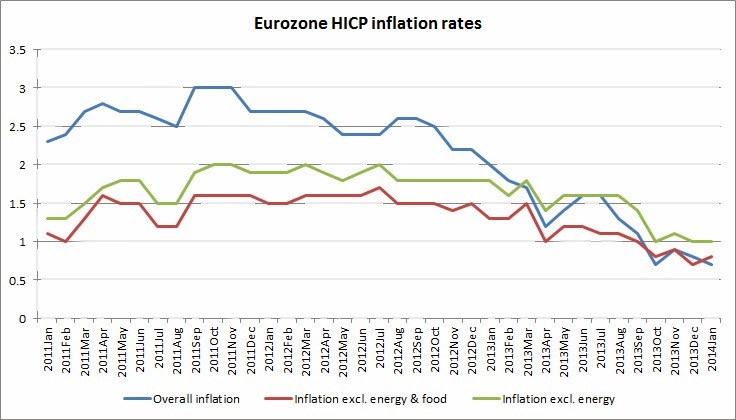 Friday saw the release of the flash estimate for annual inflation in the eurozone in January. It dropped further to 0.7% – well below the ECB’s target of 2%. The initial reaction was that this will increase pressure on the ECB for action at this Thursday’s Governing Council meeting. While that is true on the surface its worth keeping another couple of points in mind. As the graph above shows (click to enlarge), much of the recent decline has come from changes in energy and food prices. Core inflation, excluding these two factors, has been relatively stable since October and has been on a gradual decline since spring 2013. Now of course, many will point out that energy and food are important components of real world costs and therefore should not be discounted. This is a valid point, but here we are looking for insight into how the ECB takes its decisions. Generally, the ECB will be less concerned over short term moves in energy and food prices and is therefore less likely to take action off the back of this. The main part of the decline took place last year and has been happening for some time – this is likely already accounted for in the ECB easing efforts. While the inflation data may not push the ECB to act, there are plenty of other concerns. The turmoil in Emerging Markets could push the ECB to provide an additional liquidity buffer against any shocks. While this morning’s PMI manufacturing data was actually very positive for the eurozone, data on lending to the real economy and growth of the money supply is less so. As we have suggested before, some further easing is looking likely. The real question is when and how? The data suggests to us that the ECB will wait until its March meeting and its updated inflation forecasts to make a judgement – but then again it went a month earlier than expected in November. As for how, the most likely tools remain some form of targeted LTRO and/or purchases of bank loans but both programmes would require significant work and have numerous shortcomings, as we have already noted.